You drive the world’s best electric car. You should be listening to the world’s best car stereo. Our goal is to recreate the same authentic, rich sounds that were recorded in the artist’s studio and then replicate them in your car. To achieve this goal, we believe in creating new technologies, like our flagship Da Vinci DAC, that precisely reproduces even the most minute details of timbre that are lost on most audio systems. We use this same technology to bring you the most accurate pitch and intensity, the most powerful bass, and the most immersive listening experience available for Model S.
When will the bass drop? The answer is now. Model S’ factory subwoofer leaves much to be desired. Using proprietary technology specifically designed for the Tesla Model S, four dedicated amplifiers pump up to 600 watts of continuous (1000 watts peak) power into our 8 inch subwoofer that fits directly into Tesla’s bass box. 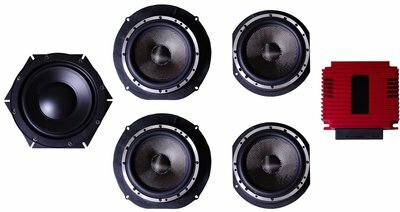 You’ll love the detail your new sub brings to a bass guitar and the deep impact you’ll feel when a kick drum hits. Our motors use ultra-efficient pure copper coils for super-fast performance. Our speakers are fast. Ludicrous fast. Because we use hand-wound 99.9999% pure copper coils in all of our custom speaker motors. These coils are beautifully married to high-efficiency, lightweight rare earth permanent magnets. When energized, our coils resonate in perfect time to the music, achieving even greater detail that you’ve come to expect from the most expensive car audio systems. High-end cars like Model S should NOT use off-the-rack audio components. We’ve tailor-made the perfect audio system for Model S, spending over a year testing, measuring, and refining every aspect of the audio system. From the smallest resistor to the largest voice coil, everything is custom made for your one-of-a-kind car. The result is the finest audio experience you can find in a Tesla anywhere. Intuitive Class D amplification with Smart Power Management consumes less energy while providing 400% more power, on demand. Tesla’s factory-installed power squandering Class A/B amplifier uses four power amp chips. Our efficient Class D power plant has eight and still uses less energy. This innovative design provides a firm bass foundation for its striking and inviting midrange tones. Its crisp, detailed highs provide a perfectly balanced punctuation to your music. Your stereo shouldn’t be sucking away battery life when you’re not listening to it. So our amplifier powers up when it’s being used and powers down when it isn’t. And it does it all in a span of only 1/200,000th of a second. In a car that values range as much as it values style, comfort, and performance, the audio system shouldn’t be power hungry. We use an all-digital energy-efficient amplification design. It consumes 50% less energy, and wastes 91% less. When you crank it to 11, it delivers more than four times the power to the speakers than Model S’ factory installed amplifier. Few have actually experienced a truly immersive stereophonic experience. Our amplifier improves the harmonic distortion tenfold over the factory offering, and lowers the entire audio system’s noise floor almost beyond our ability to measure– well beyond our ability to hear. These two improvements give you the sensation of a realistic three dimensional performance embracing you from every direction. Eco-friendly and budget conscious: two phrases you seldom see together. Taking personal initiative to reduce your carbon footprint gives you a good feeling. Accomplishing carbon reduction while saving money is an even better feeling. Our system gives you superior sound that’s much more efficient, costing you less to operate. 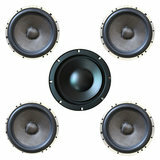 Join our community and give us your feedback and help us make the best audio system possible. There’s an old saying, “It takes a community to raise a child.” We totally take this to heart. In fact, we’ve built our entire business model on its premise. By incorporating community involvement into our product design and development, we’re able to meet the needs of our customers in ways other companies envy. We encourage you to join the community. Please join the discussion in the Tesla Motors Club forum for up-to-the-minute conversation about this project. They say we’re a bunch of smug, tech-happy audiophiles high on great sound with piles of gear that we swap in-and-out at every whim. We were laughed at for the first couple of years. We carried our 75 pound Da Vinci DAC to every trade show the world offered. Airlines hated us. Our chiropractors loved us. And once enough people had listened to our R2R groundbreaker, we were vindicated. We’ve been featured in all the major audio industry publications and have even been featured in Forbes, The Wall Street Journal, and Entrepreneur. But we’re not letting it get to our head. Instead, we’ll keep plowing forward, blazing new trails, and coming up with some seriously awesome stuff. When purchased from Rainbow Road as the European Distributor for Light Harmonic or a Rainbow Road Authorized Reseller, Rainbow Road (“Company”) warrants this product to be free from defects in material and workmanship under normal use for a period of TWO (2) YEARS from date of original delivery. In all cases you must have the original packing slip or receipt. Should service be necessary under this warranty for any reason due to manufacturing defect or malfunction during the warranty period, Company will repair or replace (at its discretion) the defective merchandise with an equivalent merchandise. Warranty replacement may have cosmetic scratches and blemishes. Discontinued products may be replaced with more current equivalent products. This warranty is valid only for the original purchaser and is not extended to owners for the product subsequent to the original purchaser. Any applicable implied warranties are limited in duration to a period of the express warranty as provided herein beginning with the date of the original purchase, and no warranties, whether express or implied, shall apply to this product thereafter. Some states do not allow limitations on implied warranties; therefore, these exclusions may not apply to you. This warranty gives you specific legal rights, however you may have other rights that vary from state to state. Defective merchandise should be returned by obtaining a Return Merchandise Authorization (RMA) number through our online ticketing support portal found at http://support.lhlabs.com. Be sure to package all defective items in the original container or in a package that will prevent shipping damage and follow the return instructions obtained from our support portal. The RMA number must be clearly marked on the outside of the package. Please return only defective components. Non-defective items received will be returned freight collect. Warranty expiration on items without proof-of-purchase will be determined from type of sales and the manufacturing date code. Freight must be prepaid; items sent freight collect, or COD, will be refused. Failure to follow these steps may void warranty. Questions may be directed to us directly at http://support.lhlabs.com. We strive to service all devices within 14 business days. However, delays may occur if lack of replacement inventory is experienced. 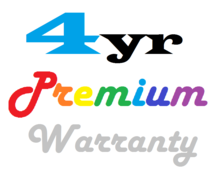 For your convience, a premium warranty pack is available through Rainbow Road that extends warranty up to 4 years. All marks displayed on on this page referring to “Tesla Motors” or “Model S” may be subject to the trademark rights of Tesla Motors, Inc. We’ve attempted to identify any rights that belong to Tesla Motors, Inc., and claim no trademark rights of our own.